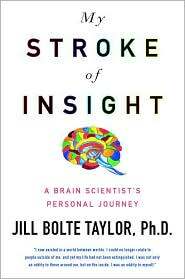 Jill Bolte Taylor became a brain researcher so she could better understand her own brother, who was diagnosed with schizophrenia. But in 1996, Taylor got a unique opportunity to study her own brain when a blood vessel in the left side of her brain exploded. In My Stroke of Insight, Taylor takes the reader through the details of that morning, as she slowly lost different functions of her mind. Then she talks of her long recovery and provides some valuable advice for how to interact with someone who has experienced a stroke. Taylor's detailed description of her stroke, starting with a pounding headache and progressing to the point of losing her ability to walk, talk, read, write or remember anything about herself, is truly fascinating. It's also very educational in that it should help readers recognize the signs of a stroke more fully. I'd say My Stroke of Insight is a combination of memoir, biology lesson and advice. As she describes her experiences, Taylor provides details on the way our brain works. She talks about the two sides of our brain, and the different functions of each. During her stroke, Taylor's left brain was affected, so she explains how it felt to be completely controlled by her right brain. She also provides a list of the "Forty Things I Needed the Most," which I expect would be invaluable to anyone whose loved one has experienced a stroke. Overall, this was an educational book, not merely a memoir. I happen to find the brain very interesting, so I really enjoyed this aspect of the book. But if you're not interested in learning about the way your brain works, I expect you might get bogged down in the details. She has a section at the beginning of the book in which she gives a lesson on the way the brain works before she delves into her experience. She mentions that you're welcome to skip this section, and I think you should if it's not your thing. Take a look at this TED talk by the author.There is a lot of repetition between this talk and the book, so you may not want to watch the entire video if you haven't read the book yet. But it will give you a better idea of her thoughts and experiences. For more information, visit the My Stroke of Insight website. This review was written based on an ebook copy of My Stroke of Insight that I borrowed from the library. I find this incredibly fascinating and remember working at the bookstore when it came out. It affected a lot of readers at that time. Thanks for sharing. Very nice review Julie, I finally finished and reviewed today, I added your review also. The part where she remembered the beginning signs of her stroke was truly amazing wasn't it.